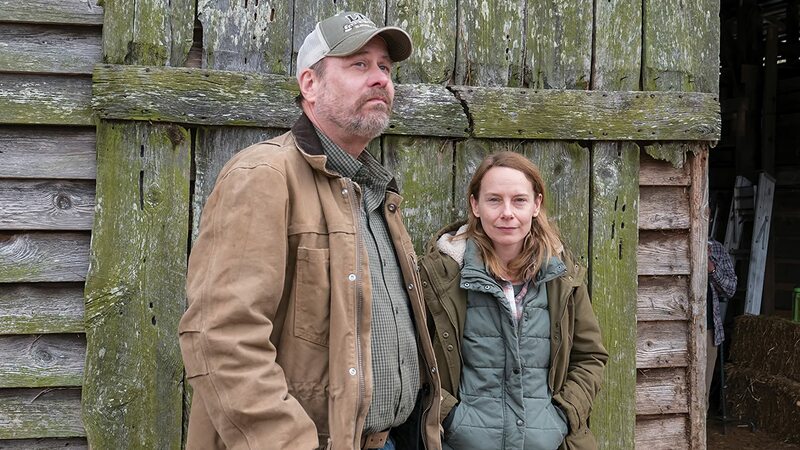 An independent movie with a budget of maybe $1-2 million, with literally only 5 actors and 2 sets (a farm house, and the tobacco farm itself), this very well acted, well written, artfully filmed piece may earn close to what it cost but not much more because I can’t imagine who is its target audience other than art film aficionados with time on their hands. It’s not an upbeat 80 minutes, starting from the first scene of a brother and sister (terrific as always Amy Adams, who must be the first choice of every director who needs his leading lady to look like she either worked on a farm all her life or is a working class bartender type with a Boston accent, and Terry Kinney) burying their recently deceased dad’s ashes in the middle of the farm. The brother is a super Jesus lover who argues the ashes need to be placed in “consecrated grounds”, aka a cemetery, while Amy’s character is insistent that they belongs right where he plowed all his life. So their relationship looks rocky but they revert to typical brother sister routine, which apparently they have been doing for 50 years, no spouses in sight. Then all of a sudden 3 old dudes show up with their tent planted on the farm, and it is either a sinister or harmless situation, so Amy brings her rifle to the confrontation. They are 3 brothers who (I was going to say spoiler alert but I’m confident anyone reading this other than Bill C. will not be going to the theater to see the film) grew up on the farm till their parents sold it (actually the mom sold it while the dad was in jail for a short while) to Amy’s dad. What do the brothers want? They won’t say directly, we can only guess, but they are alternately goofy, foul mouthed (well, only the one who had a stroke, who used to be nice but the stroke destroyed only the nice part of his brain leaving the nasty untouched or even enhanced), naïve, deceptive, and directionless. I’d describe more but the plot is not that interesting. The focus of the film according to the writer/director, Angus MacLachlan, in his comments after the film, is the land, and the North Carolina place itself, where he is from. Martin Scorcese is executive producer, and it is definitely well done, but I am hoping to be more interested and excited about the next 7 Tribeca Film Fest selections I will see.